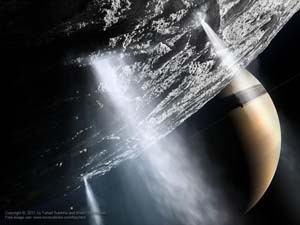 "The geysers of Enceladus are seen here up close. They are believed to be caused by Saturn's gravitational pull and the tidal flexure of Enceladus that results from it. This is enough to melt water inside Enceladus. Pressure in the liquid water chambers ejects fine water droplets to form the geysers found in the southern hemisphere, in an area known as "The South Polar Terrain." A small fraction of the ejected ice crystals is captured by Saturn's gravity and forms its E ring. Enceladus is one of only two moons in the solar system where geysers have directly been detected. From the surface of Enceladus, Saturn appears more than 50 times larger on the sky than our full moon does from Earth. In this illustration, along with some moons, the rings are visible as a line cutting through the center of Saturn."